Abathur Nope. Empower your Q and destroy the whole wave. Murky Good one. BOOM goes the fishy. The Lost Vikings Easy prey to the combos. Azmodan Your quick wave clear doesn't put Az at much of a threat, but still beware his tanky nature. Chen Chen's hard engage will often be the death of him. Line your combo up right, and watch his health just widdle away. Li Li Torn down pretty easily; just watch out for her AoE heal ult. Rehgar Not a real threat. Be aware of who he chooses to heal. Sylvanas Easily outdamaged, but make sure not to fall prey to her banshees. You must land your skillshots. Tychus Not a real threat, his chain gun can't outdo your burst. Uther Uther has very little to manage against you besides Divine Shield, but it's rarely taken. Valla Squishy and easily outcombo'd, but don't get juked by Vault. Zagara Your Q can take care of most her summons. Arthas Little threat, but try not to get to caught out by him. Your stun counters him pretty hard - as seen in the video. Brightwing Your worst fear with Brightwing is the polymorph. Also be wary of his typhoon, as it can throw off combos pretty badly. Diablo As with all assassins, be careful of Diablo's ability to break through a line and pick you out. However, this build does very well with tearing tanks down. E.T.C. Similar to Diablo in nature. Falstad Definitely try to outdamage him if he hard engages. If he barrel rolls out, don't pursue. You will outscale him. Gazlowe Turrets can zone you out pretty hard; engage with caution. Kerrigan Not much of a threat due to the slow nature of her skills, but do be cautious of her hard engage. Muradin If you can dodge his stun, you've pretty much won. However, be cautious of being caught out and stuck in the avatar stun chain. Kael is lacking in escapes. Nazeebo Dangerous only because his summon waves can't be cleared. Engage once he's used abilities, but don't overcommit. Tassadar His shields are a pretty decent counter to living bomb. Be sure to watch when he is shielding, and time your combo around that. Thrall Fight from afar, and try to dodge his root. He will take advantage of your squishy-ness. Tyrande Dodge the stun and you'll do just fine. Anub'arak His engage is nasty, but be sure to stun him when you can and line up as much of your combo as possible. Sgt. Hammer Very powerful laning due to her siege mode. Engage primarily with team, and combo hard - but don't overcommit to a kill. Illidan Illidan's jumpy nature can make it difficult to line up your combos. Be patient, and have faith in your damage. Phoenix, especially at 20, is a great tool against Illidan. Raynor A threat primarily because of his heal, but can be easily outcombo'd. Play smart! Sonya Dangerous due to her speed, gap closing, and persistence. Engage from afar, and pass bomb onto her so she carries it back to her team. Stitches Fear the hook. Fear it. Tyrael Similar in nature to Sonya. Nova Being caught out by Nova is almost certain death, as Kael has no escape. Phoenix, with it's short cooldown, is critical to countering stealthed Heroes. Zeratul Same boat as Nova, FEAR THE REWIND. Phoenix usage is key. The name is Cam. I'm a WoW player of 8 years, professionally if you count PvP rating services, although the current state of the game has lead to my recent withdrawal of subscription. However, this lead me to Heroes! I dove quickly into the game, and thought I'd begin publishing guides on the ways I've established success in my gameplay. I take great joy in helping others better themselves, build confidence in their playing, and develop their own strategies to maximize their gameplay! I encourage people to toy with Heroes and find what build works for them - this is purely what works for me. Feedback, of course, is encouraged! 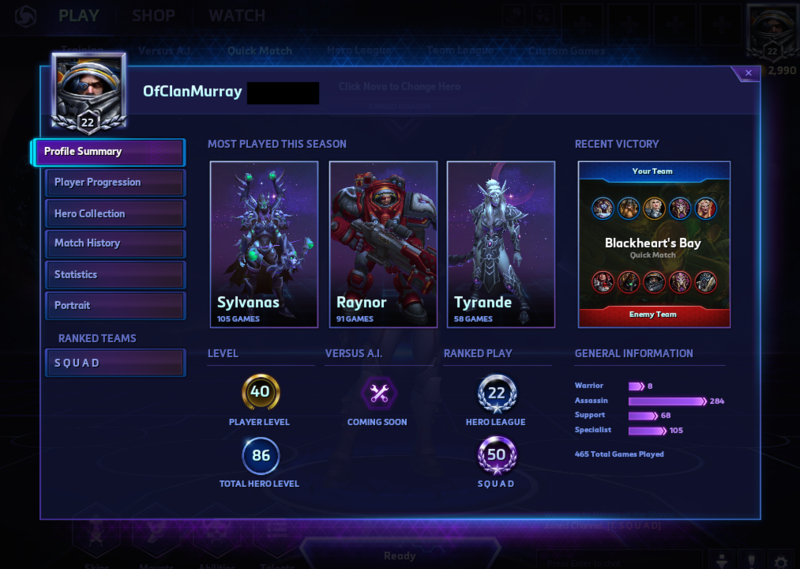 I'm currently rank 22 for Hero League's preseason ranks, with a 2300+ MMR. This guide is for Kael'thas, the lord of Tempest Keep.... and EXPLOSIONS. This build emphasizes Kael's incredible team fight capability, and insane duel damage. I'll cover the pros and cons, and cover the basic combo that will allow you to decimate whole teams in a flash of fire. HIS DAMAGE IS NOT A SETBACK, FRIENDS. Here we'll cover the pros and cons of this build! - Insane team fight damage. - Easily overpowers other assassins in 1v1's. - Perhaps the most powerful combo in the game. - Good wave clear to counter specialists. - NO escape at all. - Relies very heavily on landing his combo. - Often easy to be mana starved early-game. Go figure. Blood Elves, right? This combo is ESSENTIAL for this Kael'thas build. Directly below is a video that shows what the combo can do to even the largest of tanks in the blink of an eye, and it's even worse when you put it into a team fight. However, learning to land and execute the combo is not a simple task, but very rewarding when you do so. Kael'thas has the ability to empower one of his basic abilities by activating his trait about every 5 seconds or so. I prefer, when engaging in a team fight, to empower my E to stun up to 3 members of their team. Once this is done, you'll immediately begin casting your Q on the knocked up area of your victims. This can do a crazy amount of damage to those affected by the empowered knock-up (not to mention the Ability Power increase by Gathering Power). Right after that, get the closest target you can, and throw Living Bomb onto them. Not only will the victims of your Q be passively affected by Living Bomb due to Ignite but now you'll have a fresh target for a whole other bomb trigger. The best part? These bombs will explode, and bounce right back on to every other target in the team fight except for the original target. Meaning, you'll have their entire team exploding within seconds! As you consume more Regeneration Globes throughout the game, your total mana pool will increase thanks to Mana Addict, allowing you to perform the combo with less mana punishment in those critical late game team encounters. To finish it off, throw your Phoenix right into the middle of the fray for even crazier AoE damage, at an insanely low cooldown. At level 20, you'll even be allowed to move your Phoenix from it's original cast location using Rebirth to apply the most AoE pressure possible. Once again, this is merely a suggestion and recommendation on how to play Kael'thas! Perhaps you'll find it useful, perhaps you won't! Either way, I appreciate you taking the time to read through this guide, and hope it helps your gameplay with the lord of Tempest Keep, Kael'thas! Now get out there, and lay waste to your foes!